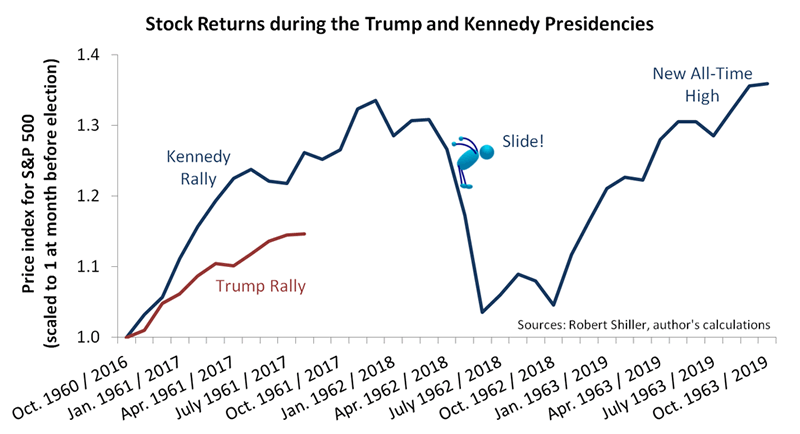 Riding the ‘Slide’: Is This What the Next Stocks Bear Market Looks Like? Even as the Fed’s decision makers are beginning to worry less about recession and more about bubbly stock prices, we’re not yet moved by their attempts to curb the market’s enthusiasm. After all, the fed funds rate sits barely above 1%, which not too long ago qualified as a five-decade low. And other indicators, besides interest rates, aren’t exactly predicting the next bear, either. Inflation is subdued, credit spreads are tight, banks are mostly lending freely and the economy is growing, albeit slowly. It just doesn’t feel as though we’re close to a major market peak. All that being said, we’re not so much about feelings as we are about delving into history (nerds that we are) and seeing if there’s anything we can learn. 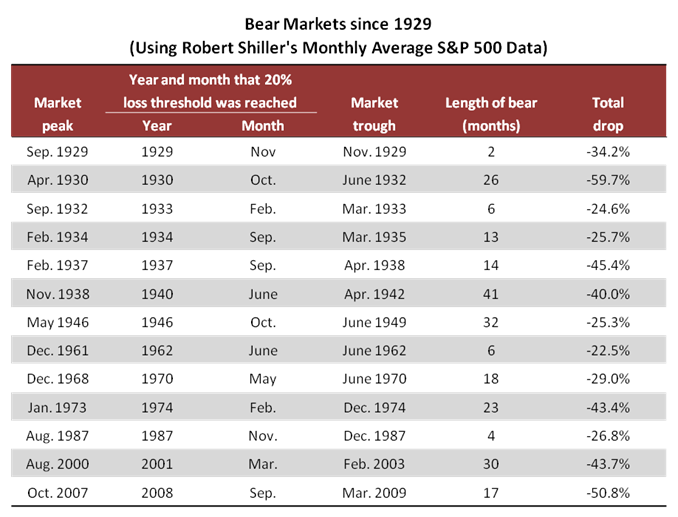 Let’s look at the last 90 years to see if any bear markets began under similar conditions to those today. Next we narrow the list by excluding bears that began during recessions, because we don’t think the economy is recessing as I write this (or recessing imminently—see here.) That removes the first three bears—those that began in 1929, 1930 and 1932. Every other bear began as the economy was expanding, which explains why market peaks are so difficult to predict. We also exclude the bear that crossed the 20% threshold in June 1940 and can’t be separated from geopolitics. Hopefully, modern geopolitical risks won’t explode as they did then, but we can always return to the “WWII bear” if WWIII breaks out (presuming we’re alive and blogging). 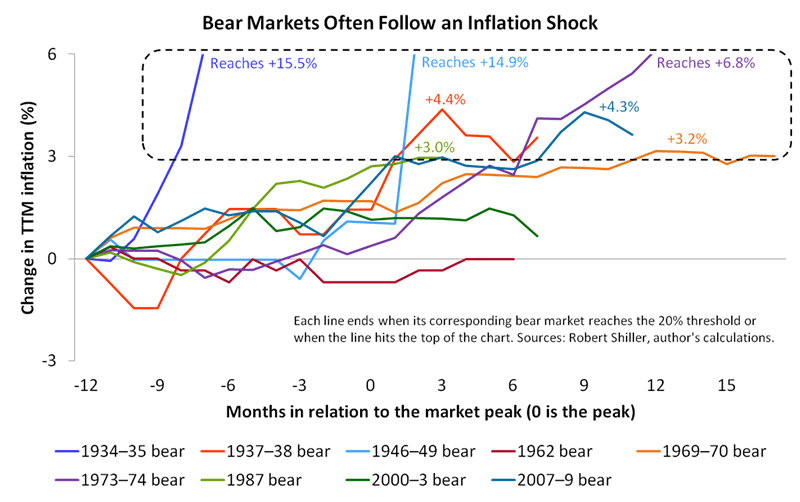 The chart shows seven bears emerging from an inflation “shock” of 3% or more (referring to an increase from twelve months before a market peak to when stocks reached the bear market threshold of –20%). In each of those cases, it seems pointless to attempt to draw parallels to today. Inflation is currently below 2% and down almost a percent from January. Without an inflation shock in sight, we shouldn’t rely on the seven “inflation bears” to predict the future. In other words, twelve of the original thirteen bears emerged from some combination of recession, inflation, world war, monetary tightening, and troubles in credit markets. In each case, market conditions were uglier than they appear now. The twelve bears tell us to be optimistic—they’ll continue to hibernate until conditions worsen. But we’ve yet to consider the 1962 bear, which finally supplies a potential match for today. Inflation was subdued, peaking at 1.3%. Monetary policy was close to neutral, with the discount rate at 3%. Growth was strong, reaching 7.4% in Q1 1962 and 4.4% in Q2, after Q4/Q4 growth of 6.4% in 1961.
Credit spreads were testing 18-month lows of just above 1% (for the Moody’s Baa Corporate versus the 10-year Treasury). Surely those cozy fundamentals explain the market’s rocket-fast recovery. Stocks reached a new all-time high in September 1963, just 21 months after the prior high. That’s the shortest period on record from one all-time high through a bear market to the next all-time high—faster even than the recovery from the 1987 crash. And what might 1962 tell us about the future? Well, as of now, inflation, monetary policy, growth and credit are only marginally less cozy than they were then. If that continues, we would bet on a rapid recovery from a Trump Slide, should one occur. But it’s important for inflation, monetary policy, growth and credit to remain nonthreatening. Any of those fundamentals could change rapidly, and they tend to correlate. (We expect monetary policy to be a particular risk within a couple of years, as discussed here.) Should the four fundamentals deteriorate, we would ignore the 1962 bear and turn to other bears for clues about what happens next. Considering the unprecedented period of monetary stimulus, we would then expect an ill-tempered bear, one that might resemble the bears that began in 1930, 2000 and 2007. When we pass the next market peak, in other words, four key fundamentals should tell us whether we’ll “ride the slide” or experience something much worse.